On vacations, James and I always make a concerted effort to see whatever culture or history is at that particular destination. 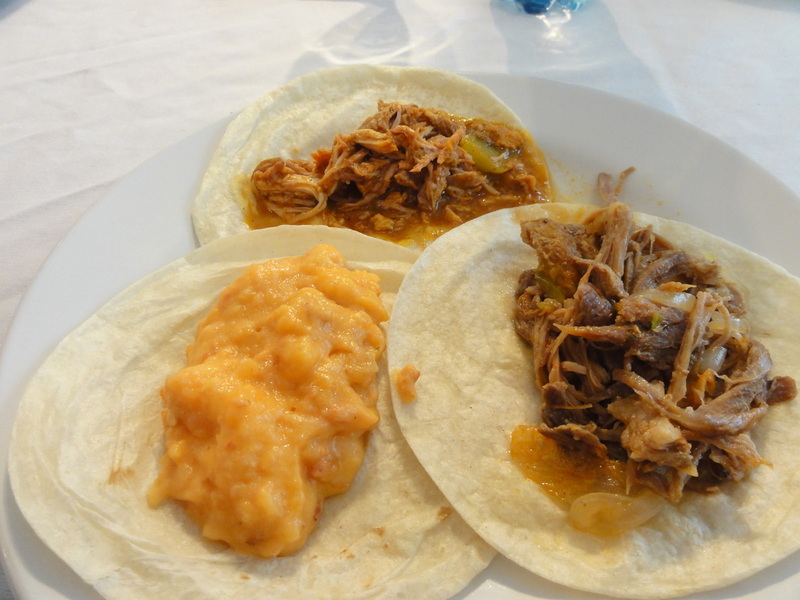 On our recent trip to Cozumel, we decided visit the Discover Mexico culture park for their new Tequila Tour which includes a guided tour through the park, light lunch and tequila tasting. Discover Mexico is within a mile of the cruise terminals, and therefore, a very quick and easy drive from the port. Just find the Discover Mexico sign at the terminal to sign in, and round-trip transportation is included. Be advised that some online tour operators which book this excursion do not provide transportation. If you are docked at the Puerta Maya Cruise Pier, it is walkable, I would go ahead and get a taxi if I were at one of the other piers. Because of the short distance, a taxi should only be $5 each way. Once we arrived, our excellent tour guide David explained what would be included in our day and showed us a short "film". Now really, this film is just a series of pictures from all over Mexico with closed captioning that is so general it could be picked up at any point in the presentation. It is on a continuous loop which lasts about 7 minutes or so. The pictures are very nice, and I remember commenting to James that EPCOT could use a presentation like this. After the film, the real tour begins with your guide explaining history, art and architecture each step of the way. There is a small museum with art and artifacts which, without David's enthusiastic and informative explanations, would have taken James and I less than 5 minutes to tour. We wouldn't have appreciated it near as much. In fact, during our tour, there was a couple who was touring independently who came in about halfway through the museum and joined us to listen to David. Even if you go to tour the park independently, find out when a tour starts so that you can hear all the information. It is included in your park admission and adds to the experience. After the museum, you are presented with a photo opportunity if you choose, with either a snake or an iguana. We weren't given the hard sell, but you aren't allowed to use cameras at all when the animals are out because they do want to sell pictures. One group did take the picture, and it was developed and shown to them during the next break. They then had the choice of whether or not to purchase. The picture was great, and the price was not crazy, so if you ever wanted your picture with an iguana or snake, go for it. 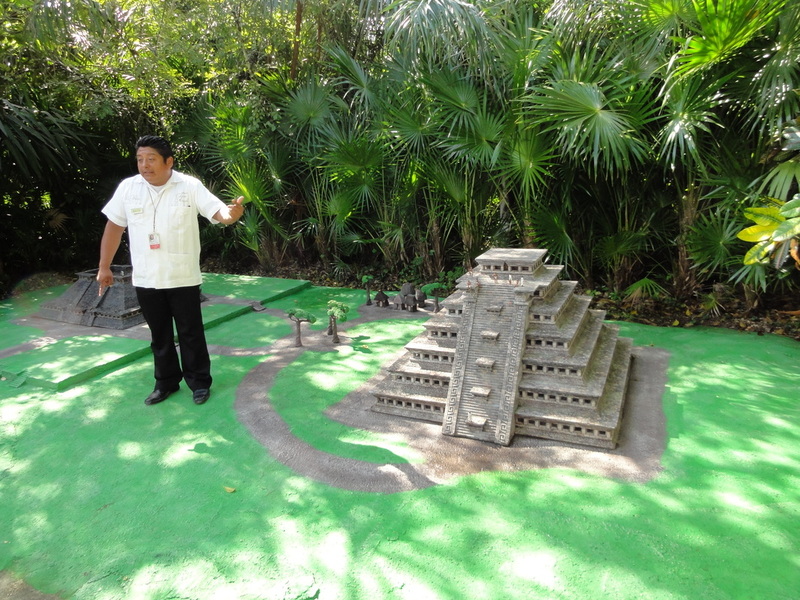 The next part of the tour was described as a "trip through Mexico", and really consisted of the history of Mexico and the background of several indigenous groups with the backdrop of scale models. I felt like this part was very well done. David didn't spend too long on any one area, but certainly educated us. Honestly, I learned more from David's tour than I did a week later when we visited the actual Chichen Itza. His tour prepared us to see the real thing, and I am now ready to visit Mexico City and the other ruins all over Mexico. Again, if I had been walking through and just reading the placards, my opinion would be very different. (Take the tour!) Halfway through the tour, you are given a break to use the restroom, purchase snacks and drinks and shop with the various merchants there in the courtyard. The vendors are not pushy at all, and the food and beverages are well-priced. If I had known that the "lunch" we would receive later was so small, I would have bought some nachos or quesadillas here which looked and smelled great. I remember one deal in particular was an order of nachos to share and two margaritas for $15. 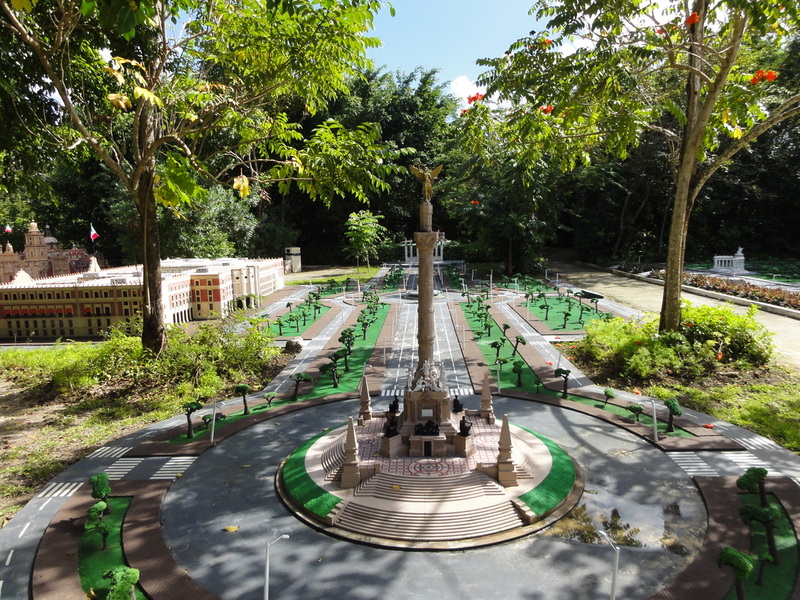 The second half of the tour takes you through colonial Mexico up through modern times with replicas of the main attractions in Mexico City. The entire walking tour takes about an hour and a half and was mostly shaded. It would be great for families as the models are interesting to look at, and the information is not so deep that it would be difficult to follow. Our group consisted of all adults, due to the tequila tasting to follow, but everyone seemed engaged and interested the whole time. The next part of our tour was the tequila tasting, so if you were to just visit Discover Mexico, only the above tour is included. For the tasting, we were brought into an air conditioned room with a long table and power point setup. David took us through a very detailed description of how tequila is made and what differentiates tequilas with an in-depth discussion on color, age and quality. The tasting was done almost like a wine tasting, and I learned a lot. 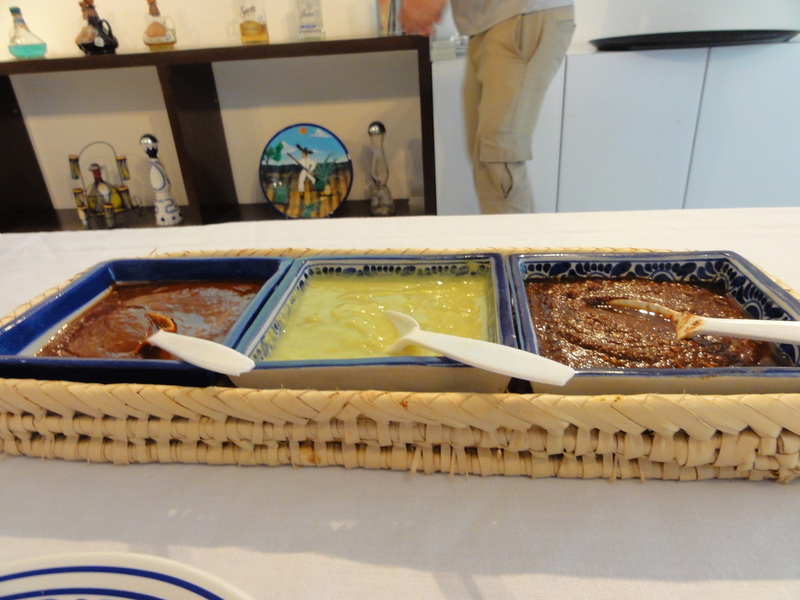 We started with 3 different ages of tequilas, and then were brought a light lunch with different salsas to sample. 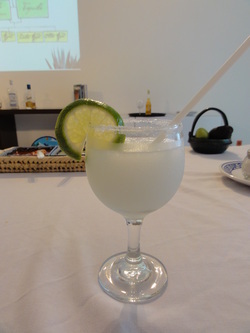 With lunch, we were given our choice of beverage between soft drinks, beer, or a margarita. Bottled water was provided. After we finished eating, we were then treated to more tequila samples, mostly consisting of dessert and flavored tequilas. At the end of the tour, we were each given a certificate proclaiming that we were "experts" on tequila. We were then given a short period of time to shop the small gift shop before being taken back to the terminal. When assessing the value of this tour, there are a few factors to consider. The cruise lines charge $68 for this excursion, which I think is a bit crazy. With a coupon off their website, you can visit Discover Mexico for $15, and the cruise lines charge about $25, which I think is close to fair because they provide transportation. So the $68 is assuming that the tequila tasting is worth an extra $43, which it is most certainly not. (Although no one on our excursion seemed put out by the price.) I found another site which offers this same excursion, minus transportation, for $27, which I think is a great price, certainly worth it. Another company offers the tour at $55, and yet another at $50. So, before you book, look around a little bit, and be certain of what is included in your package. Discover Mexico doesn't offer rates for the tour on their website, and when I asked the cost, I was quoted the cruise excursion price.